2 story Townhome with Indoor Pool/Hot tub, WIFI, 2 decks! Awesome views! The townhouse itself is well-maintained with new upgrades every year. This year, all new deck furniture. In the last 2 years, new main floor furniture including sofas, dining table, coffee tables and stools and MBR furniture with a King bed. We have tasteful nautical decor throughout, and everything you need to feel at home. The updated kitchen has all the appliances and utensils like I have at home. There is a washer/dryer to get those beach towels dry, and a locker in the covered carport with sand toys and beach chairs. We are also fully equipped with electronics like a TV/VCR/DVD in living room and TV/VCR in the master bedroom, CD player, radio, and XBox. We even have board games, books, and a video/DVD collection for those (rare) rainy days! As far as activities go, there is so much to do it is hard to list it all. 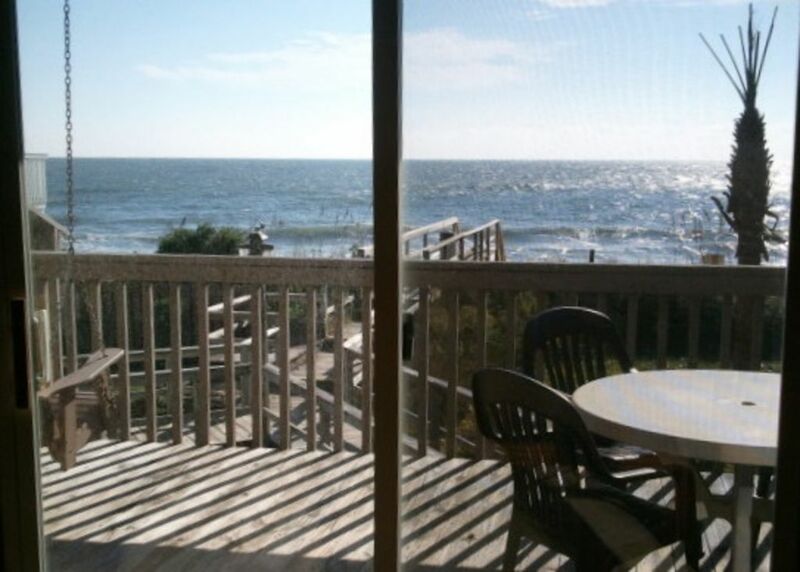 You are within two miles of the Fort Fisher Historic Site, the North Carolina Aquarium at Fort Fisher, the Southport-Fort Fisher Ferry and the Kure Beach fishing pier. A few minutes further away, you have golf, charter boat fishing, tons of shopping, and wonderful dining. The kids may like the Tregembo Animal Park, Jungle Rapids Water Park, or a visit to the Battleship North Carolina. Or, you can always just sit on the deck, watch the water, and order pizza. The choice is yours! The mild temperatures in the off season, indoor pool, and wealth of area attractions make our townhouse a great vacation spot year round. Come and stay at our place!!! There are some questions that folks often have about renting directly from a homeowner, rather than a rental agency. First time renters may be a little uncomfortable and wonder how they know we are 'legitimate'. If this is the case for you, just ask, and we will gladly provide references. We have families that are on their tenth year renting with us, and will be happy to answer your questions. Also, you may wonder what happens if something breaks during your visit since we live out of town. No problem. We have a cleaning and maintenance company right there on the island that takes care of any maintenance issues. We (the owners) are your primary point of contact, but there is a 24 hour emergency number that you can use as well. Another question is around key pickup. We have a keypad lock. You are e-mailed your code for the week, and there are no keys to pick up (or to lose!). Our guests love this feature! If there are any other questions you have, just e-mail and ask! My husband and I lived in Wilmington for 11 years before career shifted us away from the beach. We have two children in school, and know what kind of things to keep on hand to entertain them on rainy days. Prior to our move, we purchased the townhouse as a getaway and an investment, and have managed the rentals ourselves from the start. We go down several times a year, and make sure that everything is in good shape. This past year, got all new deck furniture. (We did manage to sit on the beach and enjoy it too during our trip!) Having lived in the area for so long, we are knowledgeable about the area attractions. If you need suggestions on activities or restaurants, we are happy to spend the time talking to you to help you plan your trip. We love the beach, and we love NC. Kure Beach is such a great vacation spot. Family oriented and small town feel, but right near so many things to do that you are never bored! I love my deck swing! It is my favorite place for coffee or reading. And I never tire of watching the ocean. We love hunting for fossilized Sharks Teeth at the Beach! We have found hundreds over the years, ranging from 1/4 inch to our biggest at around 2 inches... We ask guests to trace their biggest find in the guest book, and I have put some info on shark's teeth in the condo so you can tell which kind you find. Photography is also a hobby, and I have taken some wonderful photos of the beach and the area. Some of my favorites are on the walls in the condo. Aside from the beach, we enjoy excursions to Southport on the ferry. Make sure and take some bread to feed the seagulls on the ride. They will take it from your hand if you hold still long enough! Absolutely beautiful, so close to the ocean! This place has everything and it is located on the quiet side of Kure beach. Thanks for taking time to write! So glad you had a good stay, and looking forward to having you back! Thanks for writing! I always feel like it is a bit of magic to watch the dolphins :) Hope to have you back! I love how spacious it is. I also loved the swing on the deck. We will definitely stay there again. This is a great place to stay in Kure. I have never been in a hotel or rental that was as clean as this one. Our group felt so comfortable here & it was absolutely perfect for our ladies retreat weekend. There was plenty of room for all of us & just a few steps from the beach. At night, it was so quiet, except for the entrancing sound of ocean waves. We all felt so revived after our stay. In fact, we are already planning our stay for next year! The owner, Janet, was quite wonderful in that she always responded very promptly to any questions I had throughout the whole process & made sure our stay was perfect. I am so happy we chose to stay here. No doubt this is a great getaway! Everything was clean and fresh! Only thing was in the eating area was carpet, not a problem off season but would recommend doing laminate or tile. Front door knob was wiggly but worked. Overall would highly recommend this lovely villa. Ocean dunes has so much to offer. From Carolina Beach to fort fisher we stayed moving every day. We enjoyed the aquarium on a rainy day. Hikes to zekes island and visited the hermits bunker. The kids really enjoyed the ferry ride to south port. In south port we visited the maritime museum and then went to eat on the sound waterfront dining. We recommend Havana’s for fine dining and Kure Beach diner for breakfast. Britts doughnuts are only available Saturday and Sunday and are soooo good! The pool and hot tub are a selling point for the kiddos. Unfortunately the restrooms were being renovated during our stay which was an adventure with the little ones. We would go again no doubt. Thanks for taking the time to write! Britt's donuts are elusive, and I think they taste better because of that :) Glad you enjoyed your stay, and look forward to having you back! Not only is the beach beautiful, but there is so much to do within minutes. The NC Aquarium, the Fort Fisher Civil War Museum, and the Southport Ferry are all within 2 miles! There are tons of great restaurants in Kure and Carolina Beaches. Historic downtown Wilmington NC is only 20 minutes away with antique stores, shopping and more great restaurants. The Battleship North Carolina is docked in Wilmington also. There is world class golf, great fishing charters, a cool small Zoo, and the Jungle Rapids water park all right there. And if that isn't enough for you, take a day trip to Myrtle Beach SC and get all the touristy stuff around. Or you can hang out at the beach all day, sit on the deck at night, and order pizza. The choice is yours! Other Activities: Find great sea shells and fossilized shark teeth on the beach!